They invade your body … Control your mind … Blow you apart! 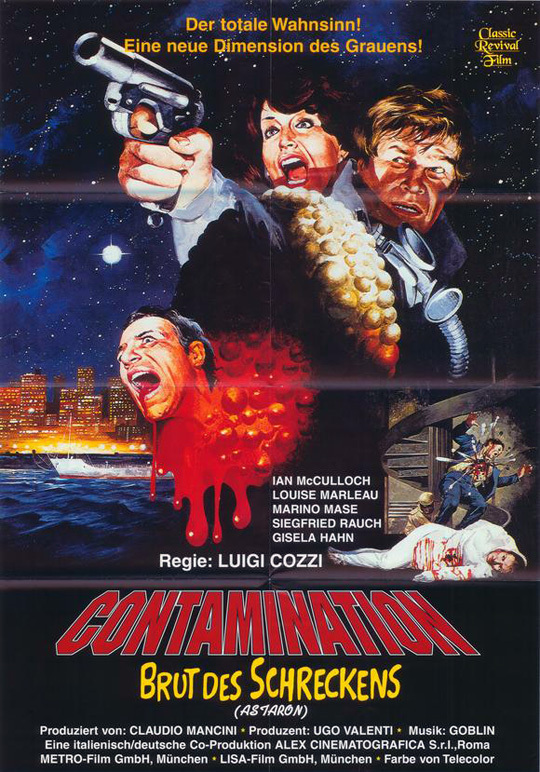 In an opening scene eerily reminiscent of Lucio Fulci’s “Zombi II,” this Italian horror/sci-fi hybrid begins with a large cargo boat drifting aimlessly in the New York harbor. The police are sent in to investigate when the crew doesn’t respond to radio communication. The cops board the vessel and find it to be completely deserted. At first all the hapless police turn up is several cases of gourmet coffee marked with a mysterious X shaped logo. Then they discover the crew members’ horribly mutilated bodies. The detectives are baffled as to what the cause of death could be, especially because the bodies appear to have been torn apart from within. But the real horror has only just begun. A detective opens one of the cases and instead of coffee, finds several large green eggs inside it. The eggs clearly didn’t come from a chicken as they resemble a cross between an oversized avocado and a mutant squash. One of the eggs is found nestled under a hot steam pipe and has grown in size. It also glows and appears to be pulsating. The dimwitted detective decides to pick the glowing green egg up and that’s when the fun starts. The egg immediately explodes and releases a thick green slime that splatters all over the detective and a few of his partners. 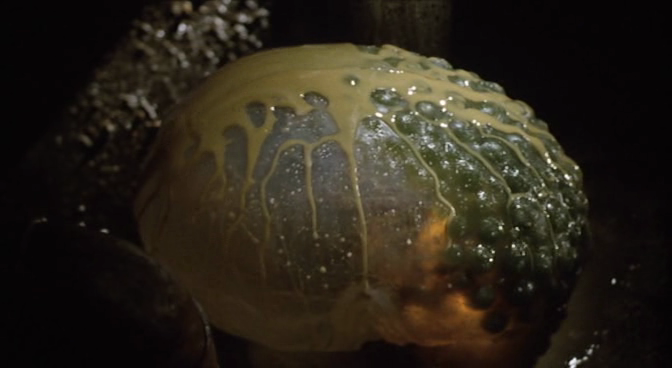 The slime then causes their abdomens to suddenly swell up until they burst and shower their internal organs all over the ship! A tough minded, top ranking Government official – Colonel Stella Holmes, is then sent to New York to investigate. Stella teams up with the sole survivor of the original investigation, Lieutenant Tony Arsis of the NYPD and tracks down the shipment of deadly eggs to a secluded warehouse. When the authorities bust into the warehouse looking for answers they instead find a band of smugglers protecting the eggs that are willing to kill themselves to avoid being questioned. The criminals commit suicide by shooting a few of the eggs and allowing the green goo to work it’s gory magic on them. After watching the men violently explode and later conducting a series of experiments on the lethal contents of the eggs, Colonel Holmes begins to suspect that the origins of this nightmare may in fact not be Earthly. In an ironic twist of fate, she then turns to a disgraced former astronaut turned alcoholic that she had dismissed as an idiot several years before. The former Commander, Ian Hubbard (Ian McCulloch of “Zombi II” & “Zombi Holocaust” legend!) is none too pleased to find the smug and self serving Colonel at his doorstep, now looking for his help. At first Hubbard refuses, but when he realizes that the ghastly horror he witnessed years before on Mars is now present on Earth he hesitatingly agrees to tag along. Holmes, Arsis, and Hubbard than travel to South America to find the coffee plantation where the eggs had been shipped from. 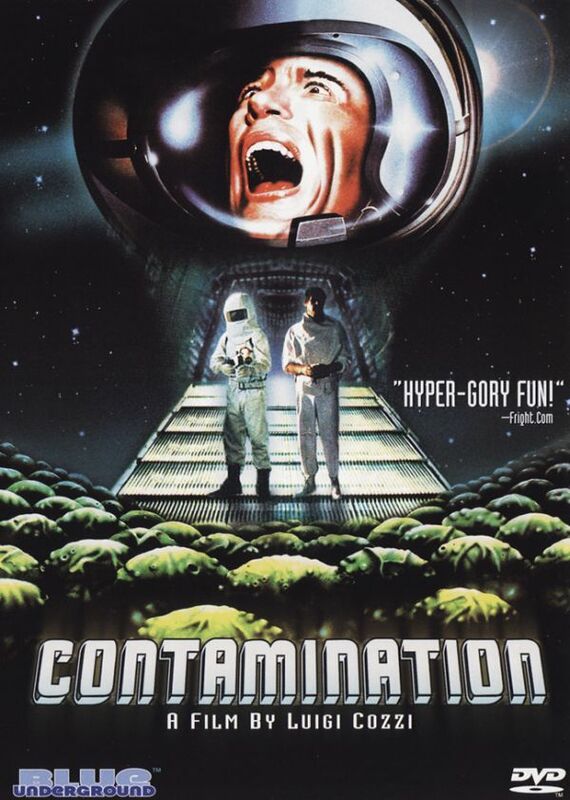 Their investigation is nearly stopped in its tracks as they battle hordes of seemingly possessed men in white haz-mat suits (shades of Romero’s “The Crazies”) and discover an over ripened egg waiting to explode in their hotel bathroom. When they finally reach the bowels of the coffee factory they get a much closer look at the source of the eggs then they ever wanted. The eggs are actually the hell spawn of a monstrous Martian cyclops that intends to take over the world! The Martian uses his powers of mind control to hypnotize Holmes and Arsis, which leaves Hubbard alone to face the ghastly alien monster. Humanity’s survival depends solely on his ability to overcome the fear that he can feel in his blood. Despite having a very low budget to work with, Cozzi was able to create some very memorable special effects. The centerpiece of the film are the spectacularly splashy scenes where bodies explode. Simplicity was the key to success; the incredible effect (credited to Giovanni Corridori) was created using foam rubber, animal entrails, and compressed air. The gory explosions were indeed nasty enough to have the film be listed as a “Video Nasty” in the UK, where it remained officially unavailable until 2004! The alien cyclops on the other hand is a little bit less convincing looking. Not surprising, considering the mighty intergalactic monster was made entirely of paper mache! 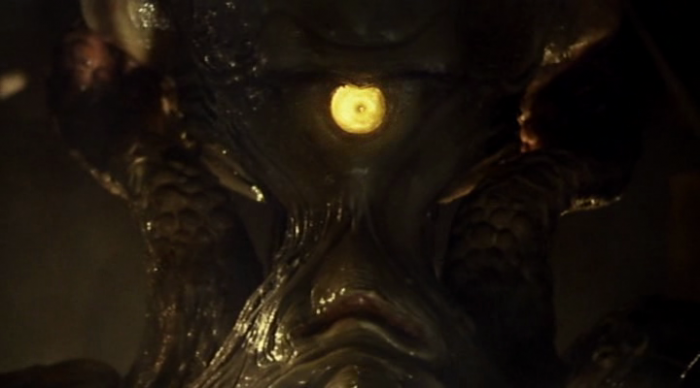 It took over 96 cuts and countless shifts in camera position to make the “cyclops” appear to move. 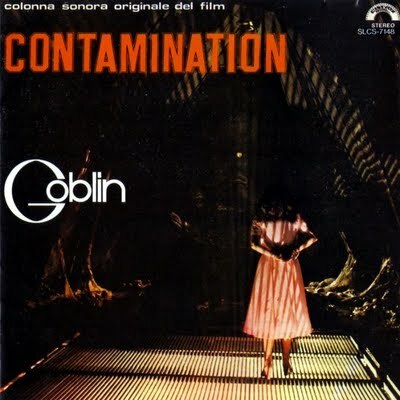 Besides the always impressive splatter, another big key to the film’s success is the fantastic score from Goblin! The pulsing techno beats add a sense of morbid, mechanical dread to the film, and also give it an unmistakably Italian flavor. Bill Lustig’s Blue Underground unleashed a beautiful looking, completely uncut and uncensored CONTAMINATION on dvd. The film can currently be found in their Midnight Movies Vol. 5 Sci-Fi Double Feature along with the Jack Palance epic “Shape Of Things To Come.” The bonus features include an informative interview with Luigi Cozzi entitled “The Alien Arrives on Earth,” a brief 1980 documentary “Luigi Cozzi on the Set of Contamination,” the theatrical trailer, a still gallery, and a nifty Contamination graphic novel based on Cozzi’s original storyboards that you can access on your PC. 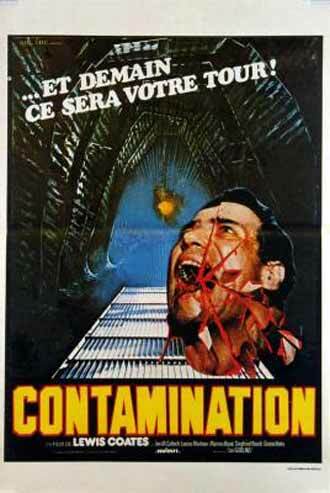 Fans of over the top Italian horror & sci-fi should greatly appreciate this one. Buy or die! This entry was posted on August 9, 2013 at 3:00 pm and is filed under Uncategorized. You can follow any responses to this entry through the RSS 2.0 feed. You can leave a response, or trackback from your own site.